Glaucoma is a chronic, neurodegenerative disease that is the second most common cause of blindness in the world. All available treatment is focused on lowering IOP to slow the progression of the disease, with no current therapy to reverse visual field loss or improve visual acuity available. Therefore, in this article, the authors describe the use of high dose omega‐3 fatty acids to combat the neuro‐inflammation in glaucoma patients, thereby improving visual acuity and visual field in glaucoma patients. Full Text paper attached. Read the summary of University of Melbourne's Department of Optometry and Vision Sciences study on an association between dietary omega-3 fatty acid intake, age, and intraocular pressure. 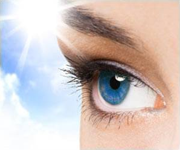 Another proof of beneficial effect of taking fish oil to strengthen and support healthy eyes and vision. Your omega-3 fish oil products may be too low in DHA. Or contain rancid oils and pollutants. Whatever the case is, you want to be sure that you are fully benefiting from your fish oil supplement. Here you can read Dave's advice for selecting a DHA or Omega-3 supplement for the eyes.